This belongs to two stay-at-home-mums who have found baking thoroughly enjoyable and an expression of love to our families. We are excited by creative ideas for baking and love to share our creations with others who share the same passions (both baking and eating). Susanne (instagram): I came from an biomedical research background and gave up my work to become a sahm to look after my children. Through some wonderful mummy friends, I picked up an interest in chiffon cakes and found my second spring! On my birthday 2 years back, I got bored and had the sudden inspiration to apply the idea of patterning to chiffon cakes. The first creative chiffon cake Sakura Matcha was born! This was followed by the creation of Christmas trees chiffon cake pops a week later. Through the friendship with a dear fellow sahm mummy, Phay Shing, Loving Creations 4 u was started, a blog to share our creative ideas for loved ones. Phay Shing (Instagram): I am also from an engineering research background. I used to play with my kids' food to create cute and fun meals before I started my baking journey. My baking journey began after I was inspired by the bakes I saw from a food group on social media, making cute steamed buns for my kids as my "first love" in the baking arena. 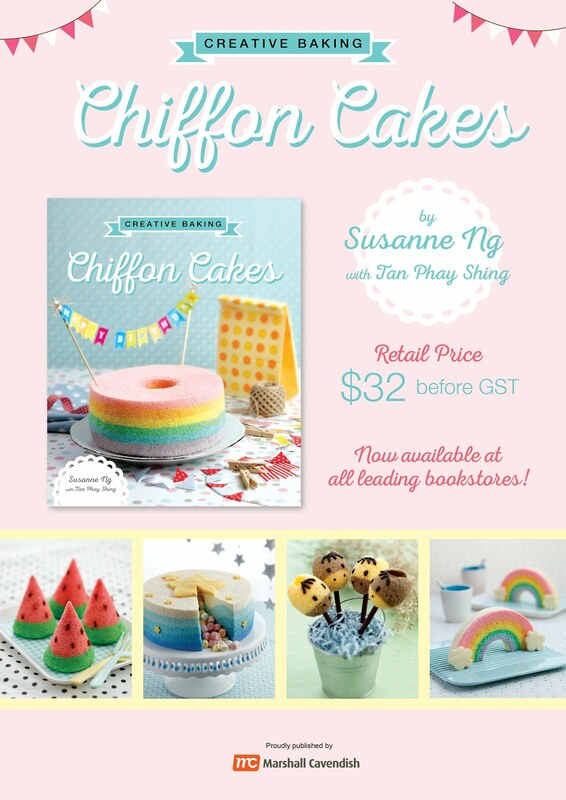 I used to stay away from making cakes as I am more of a savoury food person and don't like anything too sweet, but fell in love with chiffon cakes when I saw Susanne's first creative chiffon cakes. Inspired by Susanne, I decided to bake my first chiffon cake - strawberry patterned strawberry yoghurt chiffon cake. 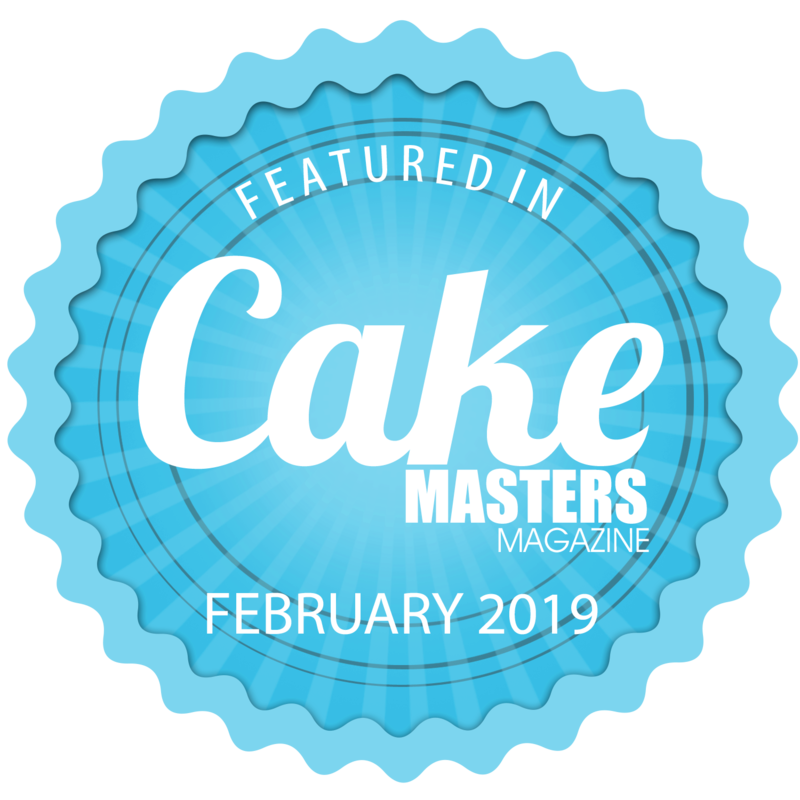 Since then, I have explored creative avenues for a variety of bakes, particularly macarons, chiffon cakes, and cookies as I get inspired by other exceptional bakers along the way. Susanne now specialises in Creative Chiffon Cakes (founder, chiffon artist). 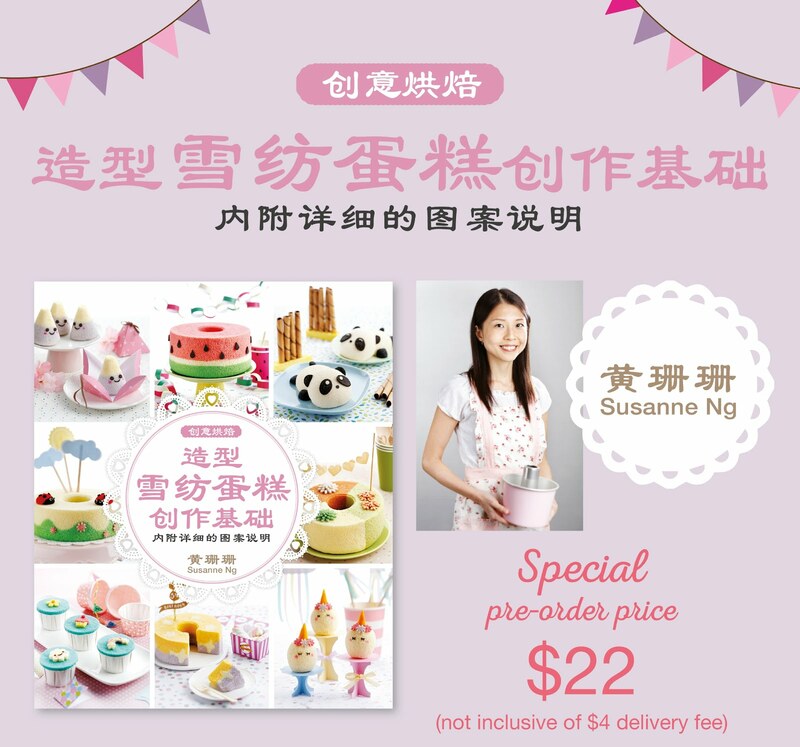 Phay Shing still loves exploring creative avenues for various types of bakes (macarons, chiffon cakes, cookies, mooncakes, steamed buns/cakes and breads) when she has the time, with Creative Macarons as a key area of her innovative work. Before December 2013, the only type of chiffon cakes you probably see were plain donut shaped ones, at most covered and decorated with cream, zebra patterned or layered. The only type of chiffon cupcakes you see would be Hokkaido chiffon cupcakes baked in dainty paper cups and decorated with cream and fruits or sprinkles. Chiffon cakepops were unheard of. On the other hand, the cakes/cupcakes/cakepops often seen in shops are often loaded with lots of sugar, covered in fondant or cream, and have textures that are heavy (or even hard in the case of cakepops). The patterned chiffon cakes and creative chiffon cakepops/cupcakes 'invented' here are both exciting in appearance as well as soft, fluffy and not sickeningly sweet in taste. The chiffon cakes come in various patterns and some even have hidden surprises in them! 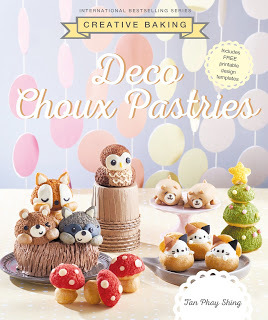 Our blog features various animal and fruit-shaped chiffon cupcakes/cakepops that are often too cute to be eaten! If you think that all cakes are loaded with tonnes of sugar and fat, and leave you feeling "jelat" after eating a slice, you have probably not tried good chiffon cakes before! Good chiffon cakes are moist, light, full of flavour and you can't stop at one slice. You won't feel too guilty about having more than a slice as these cakes are lower in calories than, say, pound cakes. We love chiffons because of their lightness and the fact that they can come in a myriad of different flavors, including savory ones! Most of the recipes herer make use of healthier oil like canola, less sugar from original recipes, and less flour to keep our cakes light and moist. Natural flavours (like tea or orange zest) are used as much as possible to keep the cakes healthy. You have seen round macarons being sold in shops everywhere but have you seen macarons that come in various shapes like different types of animals and objects? Look no further! Our blog features macarons in more shapes and designs than you can imagine! Each delicate piece of confectionary is made with the best ingredients, natural colouring wherever possible and paired with fillings that have as low sugar content as possible to make macarons that are light, almost melt in your mouth and full of delicious flavour. People have commented that the macarons are not too sweet but tasty, which is quite a feat for this dessert! Reduced-sugar option for macaron shells is also available now for those who are concerned about the high sugar content! We hope to share our wonderful discovery with you :). Journey along with us as we continue to experiment with techniques and improve our skills with practice. Feel free to contact us for any queries/customization! Due to copyright concerns, we are unable to bake commercial characters anymore, including ALL Disney, Pixar and Sanrio characters, and characters from children's programs such as Peppa Pig. We are hobby bakers who bake for interest/passion. While we love sharing new creations with love, we are actually Stay-At-Home-Mums who have to take care of our young kids, housework and families. We will try to entertain your queries if it is within the limits of our family commitments (so would appreciate if you do not expect too much of us :p). *We are privileged to have two Creative Baking books with Marshall Cavendish coming in 2016! 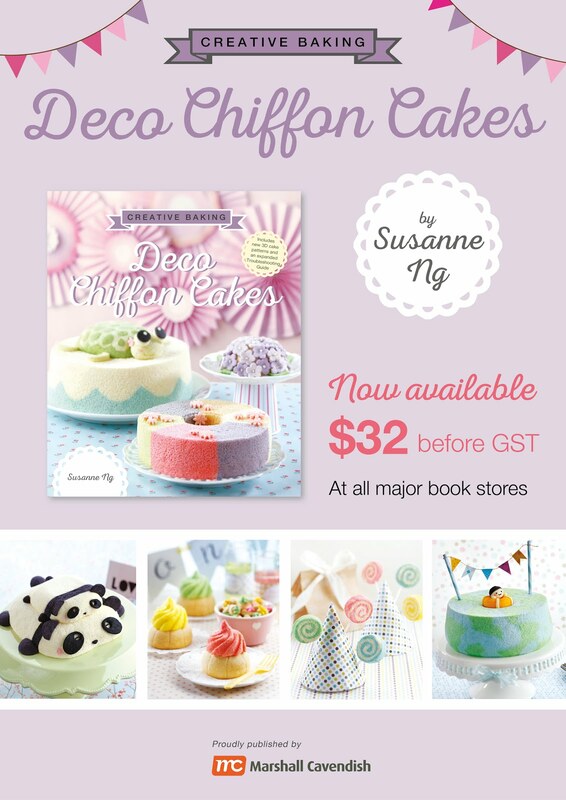 *Due to overwhelming response, there will be a 3rd book (2nd chiffon book), Creative baking: Deco Chiffon Cakes. It has been launched in Oct 2016! This website and our creations are made with love. May I know whether you are from Sg or Malaysia? Would love to place order for party snacks. Hi, your bakes are really great and lovely! May I know how to contact you for orders? Thanks! Hi Joanie, you can drop an email. Thanks! Do you ladies, by any chance, conduct private classes? I am very much interested to learn! Hi are you Bakes Huda? We should be learning from you! Yes, I am! Me? But I can't do such wonderful cakes like you ladies! Hi Bakes Huda! I love your bakes! Currently we are both sahms looking after our young children so it's a bit difficult for us now, but we do keep the option open when they are older. When we do, will sure to inform you =). Ladies, your creations leave the (so-called) professional cafe and dessert places here in Australia in the dust! Your cakes look almost like toys -flawless color, quality and smooth finishes. Just amazing (and I agree, why would anyone eat any other dessert than Asian (okay, or French) sweets?) Please put more photos in Facebook, I can see myself "Liking" absolutely everything you post!! Your products look amazing! I m counting down the the days for me to order a birthday cake! Hi, I followed your book recipe,however,when I piped the Macaron batter it really turn out watery. Is that normal? There could be a couple of reasons why your batter is runny. Most likely you could have overfolded the batter. The well folded consistency shouldn't be runny at all. You could have underbeaten your egg whites before the sugar syrup is added in, resulting in anItalian meringue that is not firm enough. Try using slightly less meringue as well if you still find it runny. The basic recipe with a fixed ratio of ingredients I use is quite a standard one that many bakers use so it should work. Keep trying and you will get it right eventually :). hi, do you do yam flavour for chiffon cake? hi! i really love your Naturally Coloured Rainbow Iced Gems Biscuits and would like to ask if these are available to order for my son's 1st b'day? Hi please email us at lovingcreations33@gmail.com for sales enquiries. Yes I make those for sale. Thank you! Hello.. I finally got both the books. They are amazing. Can't wait to try them out. But I am disappointed with one thing about the books. The photos are all way too dim. Cannot see the details especially some of the pictures are small. I hope your next book will take attention of this issue. Other than that the books are great. Thanks for your valuable feedback Jolie! Have reflected this to MC and they will brighten up the images in next book. Do you refer to the step by step pics? Thank you! Are your cakes suitable for Muslims? Nope, no pork or lard, but not halal. Thank you! May I know if the cake is Hala? Nope no pork no lard but not Halal. Thank you! Hello there! I LOVE YOUR BOOKS AND YR BAKES! 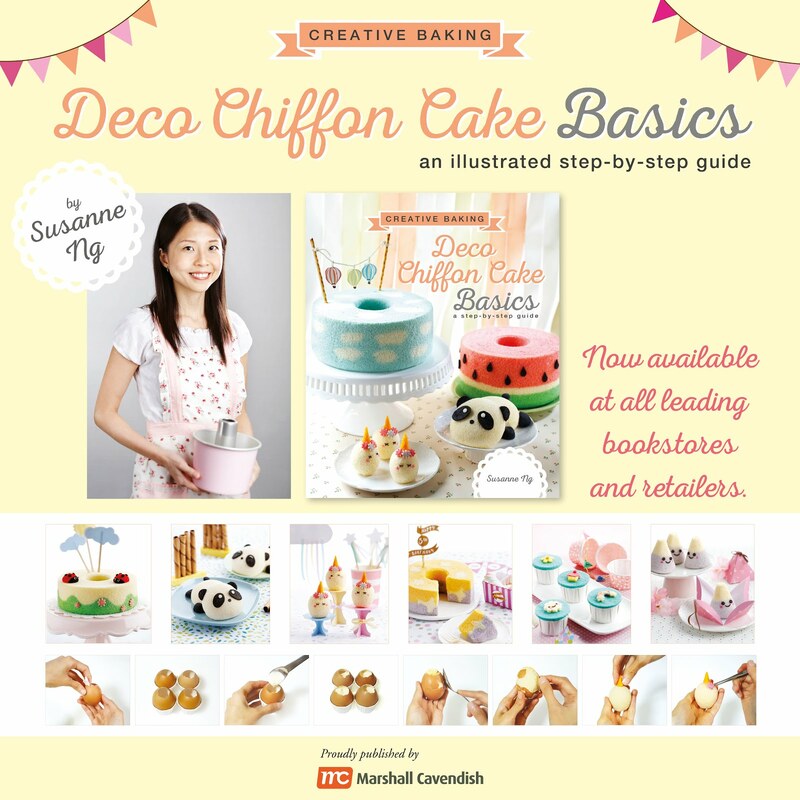 =) I've been inspired to bake chiffon cakes after visiting your site and buying your book! I have a question to ask though. After baking and the cake skewer comes out clean, after cooling and removing, somehow the top layer will get abit 'sticky'. It happens to my chiffon cupcakes too. Is it because of the condensation during cooling down period? I hope to hear from you soon! You're my inspiration! Hi Bat, yes, the chiffon cakes have sugar which are hygroscopic and absorb moisture in humid environments. For me it usually happens hours or a day after I keep the cakes. Usually I will remove it by sticking a piece of baking paper over and it should come out quite cleanly. Thanks! I think.. you ladies are geniuses =) thanks for sharing - i'm looking forward to making these.. Thank you for your kind words :). Thank God for giving us the inspiration and strength to carry on creation after creation. Yes thank God! Thank you too! Hi....i wanted to buy a chiffon cake for my girl birthday....how can i contact u??? Hi, please email at suslovingcreations@gmail.com. Thanks! 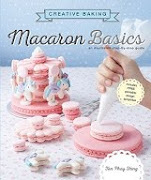 I recently bought a copy of your macaron book and tried your recipe but I am puzzled by the outcome. Firstly the batter turned out more runny than french method i.e. batter was almost flowing out from piping bag. And weven tho i made sure it dried up before puttin into the oven, no feet formed. Do you have any idea what happened? Otherwise macaron came out smooth top and tasted good but no feet. Never had this issue with french method. Do give me your thoughts on what went wrong. Thanks for getting a copy of the book :). My guess is the Italian meringue was not stiff enough. Since you have experience with the French method I am guessing that you know what consistency of batter you should get so I am ruling out overfolding. The egg whites have to be beaten to soft peak stage before the syrup is added in. Syrup temperature must be at least 115°C before pouring in. The electric mixer speed has to be high throughout as the meringue cools. It may take anywhere from 10-15 minutes. Make sure that you keep the beating speed at high all the way until temperature is body to room temperature. I hope this helps :). The batter shouldn't be runny at all. My daughter wants me to make unicorn face macarons for her bridal shower like the ones Mac Lab Bakery. I saw your unicorn macaron templates so I was wondering if you would make the faces following the same procedures as you do for the unicorns by piping the mixture on to a template? And how do you put the eyes and faces on? Hi, you may make the templates for the unicorn faces the same way as I did for my full body unicorns with wings. Just print it out on a sheet of A4 paper. The same principles of piping applies regardless of design. Eyes and other facial features can be added on either with macaron batter or post-baking using edible marker or royal icing. Sometimes I add on rosy cheeks using lustre dust and small brush for some of my bakes. I hope this helps! I posted the previous blog about the unicorn faces. I would be willing to come to you for a private lesson as well. justme9598@yahoo.com. I currently make and decorate cakes and other treats as a hobby for friends and family so I have experience with baking, chocolate and decorating. Hello- I live in the U.S. and would move to purchase your book. Do you think the recipes would be easy to follow? Will your designs work if I used the French method? 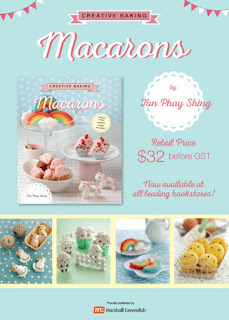 Have you tried any durian fillings for the macaroons? Thank you! Recipes are easy to follow but the techniques may take time to master if you are not familiar with making Italian meringue or using the Italian method. The designs should work if you used the French method as well. It's just that for a batch with more than one colour, you have to prepare the meringue a number of times and colour adjustment may be more tricky as the french method is less forgiving when it comes to overfolding. I would like to order a chiffon bday cake in mid feb. Sent email but no reply. Susanne.... u are my idol.... I hope 1 day I can be like u... am a stay home mum too... still very lost of job after giving last JUL. If u need free larbour.. feel free to contact me... haha.. Thanks, what's your name? Sometimes the email doesn't get forwarded. But Feb is full already. Sorry and thanks! I have bought your 2 books and have tried a few recipes for chiffon cakes. However my cakes turn out with browning skin at the side and top. What must I do to achieve the result same as the photos in the book? Which is no browning skin but the actual colour of the cake , example rainbow colour . Hope to hear from you. Thanks! Thank you, you will need to lower your temperature and bake longer. Do not use fan mode as well. May need to optimise a little, I do it for all my new ovens. Thank you! Great work on the chiffon cakes. Just wondering if the chiffon tube pan you use are of different diameters at the top and bottom of the pan i.e the top of the pan measures 18cm but the base is actually smaller say around 16cm or are you using a chiffon tube pan which has same diameter measurement top and bottom? This is because i noted your rainbow chiffon method requires the batter to be divided into 6 equal portions and if so, the outcome of the colours will not be equally proportioned if the chiffon tube pan is not a tall straight pan with same diameter measurements at the top and bottom. Can you let me know where you bought your chiffon tube pan? Or the brand if any? Hi measurement is from the top. I bought from Phoon huat. Thank you! Hi Susanne, I've dropped you an email on some chiffon cake order enquiries. Just incase my email did not get through, please let me know. Hoping to receiving your reply soon! Crystal. Thank you, have I replied? May have a problem with the email forwarding. I will check. thanks! Hi there, I stumbled across your website and it's very inspiring! I have a question about your oven/s - do you use fan-forced for chiffon cakes? Do you have a preference either way? Thank you, it sounds difficult. Usually via email. Thank you. Can you advise how to place order for your wonderful chiffon cakes? Thank you usually via email above. Love your creative n creation..
Where can I get a copy of Ur book? I work for Delish.com in the U.S. and we would love to consider your cakes for an upcoming video on our site. We share these with our 21 million monthly unique visitors and 14 million Facebook fans and they always perform very well. I'm hoping we can get in touch about photos and videos you may have that we could use for this and also to interview you to get more information about these amazing creations. You can reach me at rbellomo@hearst.com. Thanks I have already replied your message. Thank you! I am from India. Love it creations. PLZ tell me why we should not add color in the toll n mirangue mixture. why we should mix in yolk only? Hi, I would like to enquire for your cake but I don't have email address. How else can I contact you? Thank you, it's above =) suslovingcreations@gmail.com or lovingcreations33@gmail.com. Thanks! I would like to order a cake for my son. How do I place an order for your rainbow cake? Hi do you think you are able to design and bake a "castle" cake for my baby first birthday in 7 Oct 2017? Please advise how do I contact you? My email is dianegiam@gmail.com and my mobile is 83836066. Thanks. Hi, i have just dropped you an email for cake order. My email address is seew2@hotmail.com. Hear from you soon. Tks! Hi, i’ve dropped an email with regards to ordering a chiffon cake for my husband’s birthday in July 2018. Hi, do you have a workshop on how to create these adorable chiffon cakes? I have sent an email about cake order on 25 Mar 2018 for my daughter's birthday on 30 Apr 2018.. Hope to hear from you soon. My email is mmpiglet71@gmail.com. Hi! How can I place order for my daughter's birthday? Hi, just email us :). The addresses can be found under the enquiries section on this page. Thanks! Hi would like to request for your pricing for order for my little girl birthday cake. Going to give it a go here in the USA just 15 MI south of LAX. At age 60 I started with moulded and colored cocoa butter bonbon for family and charity events with polycarbonate moulds and a small tempering machine. I slowed down at 70 when a smallsmall throat cancer set in and was quickly taken care of thru biomedical research study UCLA plus traditional hand laser, nearly 40 TrueBeam radiation and 15 Chemo. Now at 75, next week, hopefully I can pull off a small segment of your skill set. And I'm ready to go, 2 grandkids at my side begging for mango, orange, key lime, chocolate, Vanilla Chiffon from Kings Hawaiian bakery. For me I've got to give it a go. Ready with AnmeriColor 20 pack of tints, plenty of eggs and your scientific talent structure packed in the two books I've purchased. 1. Can I use a set of 7inch x 10 inch Panettone pans. 2. Can I use a heavy 10 in bunt pan, small indentations. 3. Even crazier, have you attempted a round Japanese Jiggly Cheesecake Chiffon style. I've had something a little close, at a Chinese bakery chain here in Los Angeles. 1. Yes Panettone pans no problem. 2. Yes you can, as long as its not non-stick coated. Will buy wonderful Macron book, but 2 grandkids in our house nut allergy, do almond anything isn't working. Hello, are you able to get pumpkin seed over there? It's suitable for people with nut allergy. The other substitution would be cake flour but it would change the texture significantly. Thank you for the suggestion. Pumpkin or sunflower seed dry flour. Great idea. You've given me the desire, courage and your instruction skill set. I will give simple cakes a go and make my own birthday cake or cakes for next weekend. Simple, delicate, tropical in flavor.